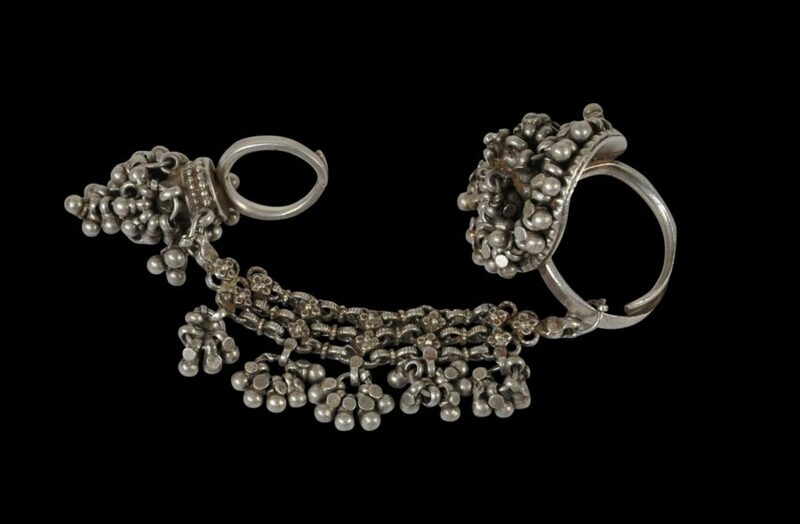 This interesting item of foot adornment is a toe ring set and made of solid silver. It comprises a large toe ring and a little toe ring. Each are decorated with dozens of suspended silver pellets. 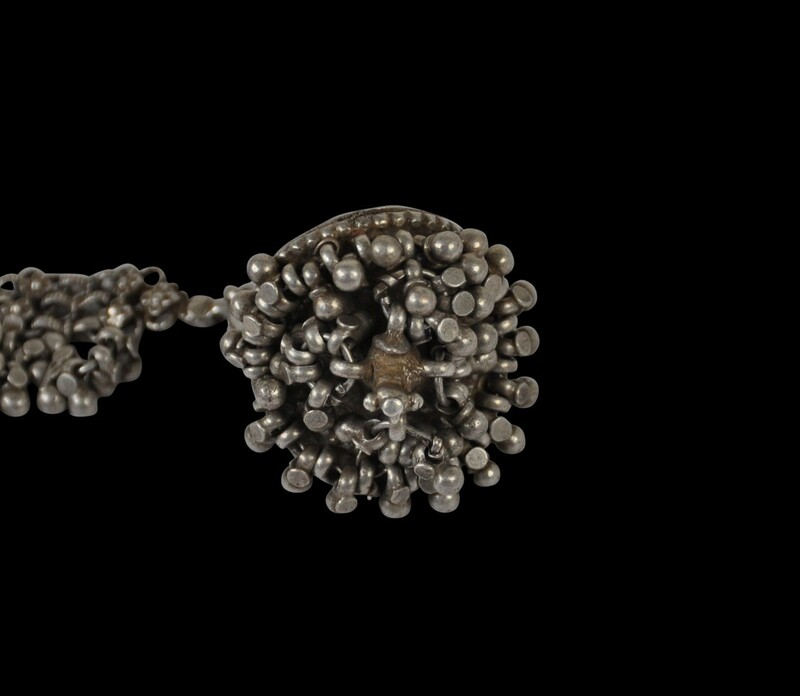 A complex, three-row, silver chain decorated with silver flower motifs and from which are suspended five bunches of suspended silver pellets, links the two rings. The device is worn such that the big and little toes are inserted through the rings and the decorative chain runs across the remainder of the toes. Related examples are illustrated in Jain-Neubauer (2000, p. 49), Barnard (2008, p. 112), and Untracht (1997, p. 277). There are no obvious losses. The set has wear and obvious age. Jain-Neubauer, J., Feet & Footwear in Indian Culture, Bata Shoe Museum/Mapin, 2000. 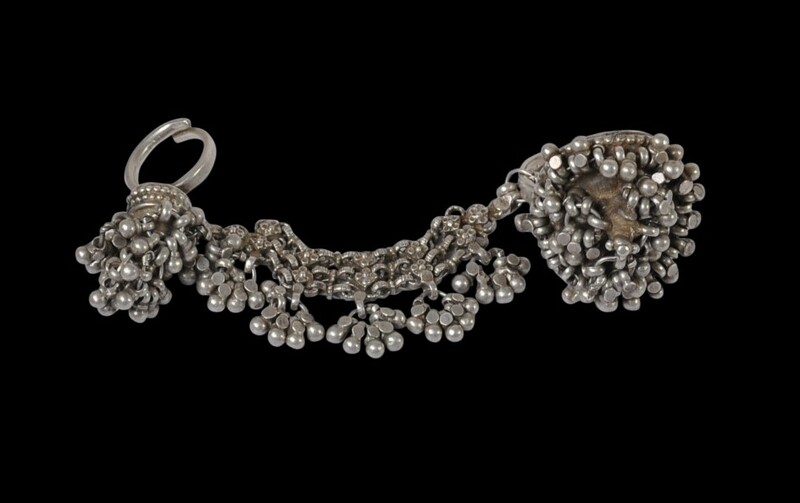 Seligman, T., & U. R. Balakrishnan, Enduring Splendor: Jewelry of India’s Thar Desert, Fowler Museum at UCLA, 2017.